Last night was Barossa’s night of nights as the wine industry came together to celebrate the 39th annual Barossa Wine Show. With 717 wines entered in this year’s competition – up by 116 from last year – it’s a testament to the growing quality, confidence and pride of our region’s. International guest judge Lisa Perrotti-Brown spoke highly of the entries, noting in particular the 2015 rieslings and 2014 grenache. 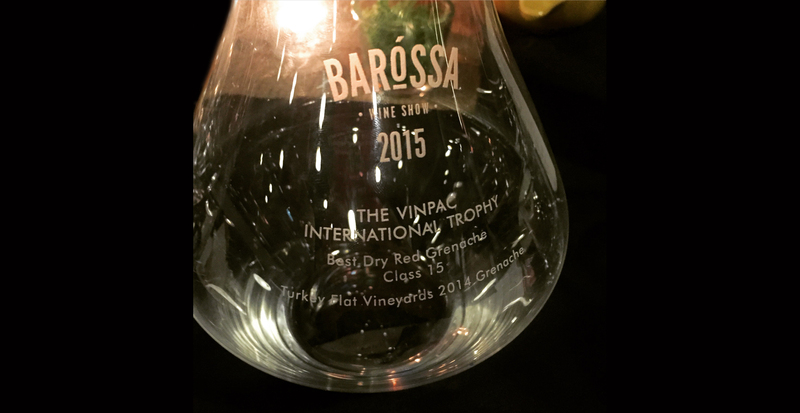 2014 Turkey Flat Grenache – Gold & The Vinpac International Trophy winner! So the celebrations continue today – just in time for International Grenache Day too! To say that we are thrilled and honoured by the results is an understatement at the least. We must also congratulate all the trophy and medal winners last night – very well deserved, each one of them!